In a laboratory study of endothelial cells—which line the inside of blood vessels—researchers tested compounds designed to target mitochondria (the "power stations" of cells). The findings raise the possibility of future treatments not only for blood vessels—which become stiffer as they age, raising the risk of problems including heart attacks and strokes—but also for other cells. "This is not just an effect of ageing—it's a reason why we age. "The compounds developed at Exeter have the potential to tweak the mechanisms by which this ageing of cells happens. "We used to think age-related diseases like cancer, dementia and diabetes each had a unique cause, but they actually track back to one or two common mechanisms. "This research focuses on one of these mechanisms, and the findings with our compounds have potentially opened up the way for new therapeutic approaches in the future. "This may well be the basis for a new generation of anti-degenerative drugs." Professor Harries said the goal was to help people stay healthier for longer. She added: "This is about health span and quality of life, rather than merely extending lifespan." In a paper published last year, the team demonstrated a new way to rejuvenate old cells in the laboratory. 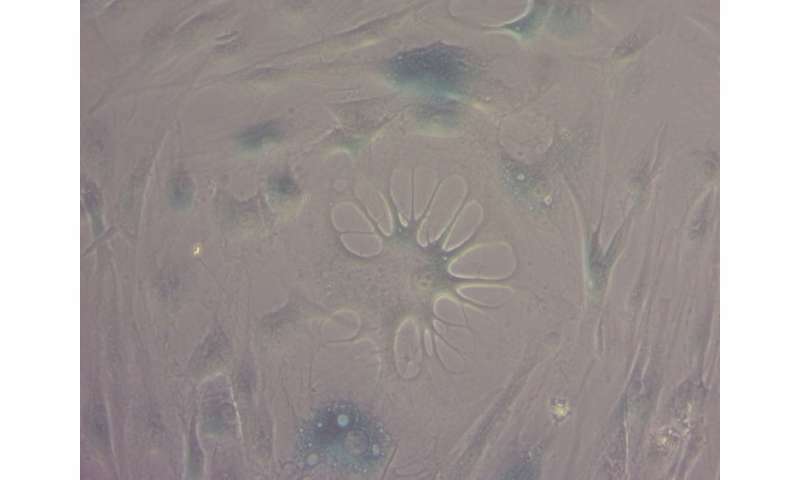 However, the new research looked at precisely targeting and rejuvenating mitochondria in old cells. "Nearly half of the aged cells we tested showed signs of rejuvenating into young cell models," said Professor Harries. The compounds in question—AP39, AP123 and RT01—have been designed by the Exeter team to selectively deliver minute quantities of the gas hydrogen sulfide to the mitochondria in cells and help the old or damaged cells to generate the 'energy' needed for survival and to reduce senescence. "Our compounds provide mitochondria in cells with an alternative fuel to help them function properly," said Professor Matt Whiteman, also from the University of Exeter. "Many disease states can essentially be viewed as accelerated ageing, and keeping mitochondria healthy helps either prevent or, in many cases using animal models, reverse this. "Our current study shows that splicing factors play a key role in determining how our compounds work." We can only believe if those compounds work on our President, who is 71; May be getting close to 72, Who Knows ! Very good way to prove their point. There is every indication that the president is already undergoing sulfide treatment as evident by his "glistening" appearance at a rally in Ohio over the weekend, where he looked like "C-3PO crossed with a glazed ham."